Despite a reputation for being quieter, we now see very little drop in buyer activity during the summer months. With over 50% of our website views coming from mobile devices, we are regularly contacted by people at the beach seeking to book appointments for when they return from holiday. If anything, it’s sellers who hold off putting their property on the market until September, often believing there’s no market. Ironically, this creates a real opportunity for making a bigger splash for anyone putting their home up for sale before the schools return. 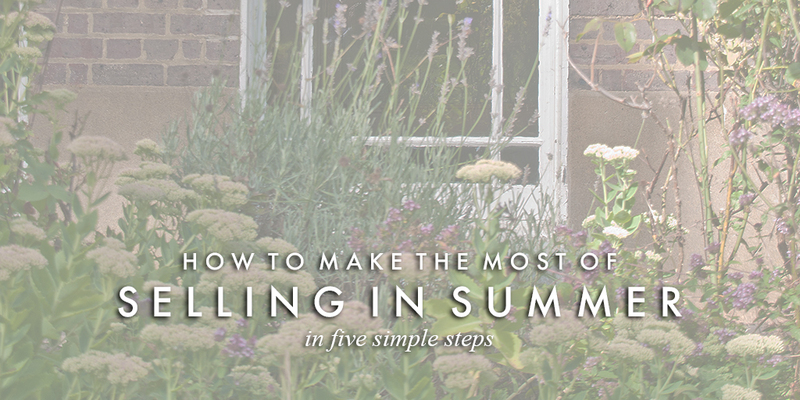 So here are five simple steps to make the most of a summer sale. And if you’d like any more advice on the right time to sell your property, feel free to stop by, email or phone. Given the size and area of the front porch, buyers spend a disproportionately long time there, so it’s well worth investing in making a positive first impression. Paint the door, add a hanging basket or two, tidy up the frontage generally and you’ll set the right tone for the rest of the viewing. Brilliant sunshine shows your home at its brightest and best, but it’s also the weather that highlights dirty windows. So now is the perfect time to clean those panes and to tie back or trim any overhanging creepers. Remove paperwork and other alien clutter from kitchen work surfaces so your fancy gadgets can shine. For bathroom bottles think Jo Malone, rather than Head & Shoulders. Mow the lawn, sweep the balcony, weed the patio. Dust off any garden furniture and put it on display. If you don’t have any, it’s worth buying or borrowing to give an inviting purpose to your outside space.